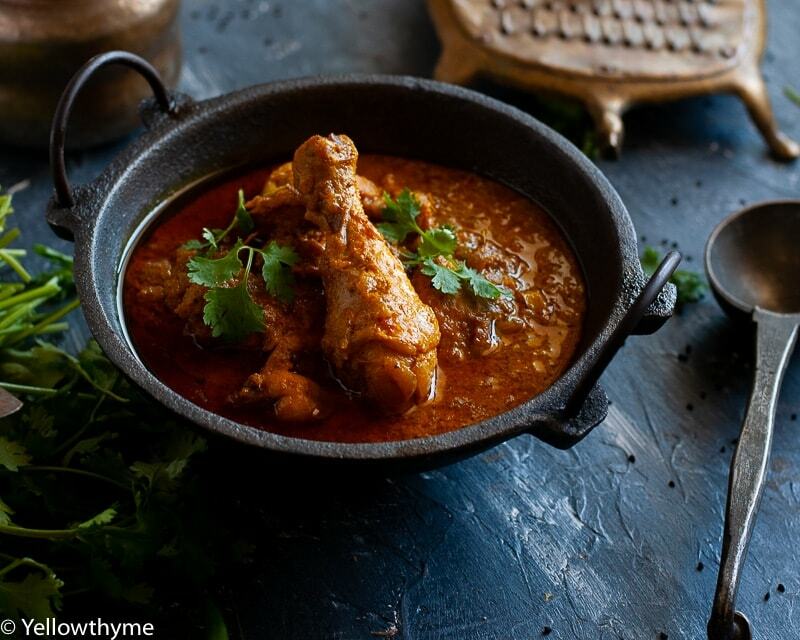 Achari Murgh Curry is a delicious , rustic north Indian Chicken Curry. It’s a perfect example of simple North Indian regional cooking !It’s made with Chicken on the bone, Indian pickling spices, lime or Mango Achaar or pickle,Mustard Oil and yogurt which give it a quintessential “Achari” taste. You could eat these with Chapattis or Moong Dal Chilla ,if you are controlling your carb intake.I frankly love this with some homemade dal chawal too! You can read all about how I make dal at home here. Also! This curry can be made with boneless chicken too.I even do my Indian meal prep using this recipe- Just cook 4 chicken breasts in the same spices and yogurt and divide between 4 boxes with some brown rice, quinoa or Millets and your meal prep is done! But if you are looking for a RICH Chicken curry which will wow all your family members then you should make this with chicken on the bone and with skin.This ensures maximum flavour and depth. published by Roli Books.I got this book as a gift for Christmas from my secret Santa.I swear its the best secret Santa gift I have recived in my life(Thankyou Ruchi,if you are reading this!) This book has over 500 recipes from all over india and is a true gem!It’s always on my coffee table now. Blend the ingredients listed under the Achari Masala- Red Chillies,Methi Seeds,Mustard,Fennel Seeds,Nigella Seeds and Salt. Mix the blended dry Masala, Yogurt, Turmeric and Salt.Marinade the chicken for at least 15 minutes and for best results for 12 hours in the refrigerator. Heat Oil in a Deep Pot on high heat.When the oil starts smoking, reduce the flame to low.Add onions,Green Chilli, Ginger & Garlic. Sauté till the onions turn golden brown.Add the coriander powder and mix well. To this Add the chicken along with the marinade. Bhuno or saute this for about a minute.Add Chopped up Pickle and 1 cup water.Check the salt, add more if needed. Cook covered for 30 minutes on medium-low flame. If you want a thicker gravy, just cook the chicken uncovered for a few more minutes till you get the desired consistency. Here are some other North Indian Curries that we love at our home!